10 Ft. Ganja Plant is a group of musicians with a common goal to spread their positive messages and play the music they know best, Roots Reggae. 10 Ft. is composed of various musicians, stemming from the popular group, John Brown’s Body. 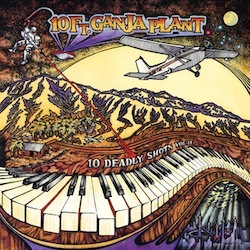 10 Ft. Ganja Plant is a sort of ‘get away’ for collaborating musicians to just relax in comfortable atmosphere away from touring, deadlines, & stress and make music the way it should be made, while having fun with lots of love. Being connoisseurs of music, this group only collected the finest of vintage equipment and recorded all together to get that authentic, tightly kept sound you hear. Like something off of a nasty old school Jamaican movie soundtrack with loads of car chases and intense shootouts, this album has the heavy roots to move you and melodic leads to get you grooving. This album features an instrumental groove factor and lets you fill in the blanks for the vocals – or just gives you a soundtrack for this beautiful life. Just from the names of the album and songs, you can imagine the number of different deadly scenes in this could-be Jamaican thriller movie. “10 Deadly Shots Vol. II” is a continuation of Volume one and features long-time friend, the Aggrolites keyboard king Roger Rivas tearing through the sound waves on each track. Leading off with the first track, “Rooftop Duel,” 10 Ft drops us off with some heavy bass and a nasty one drop drum line led in by a famous old school fill. This song features a number of bluesy, crying melodic leads mixed in with a constant running staccato bass line and expertly layered rhythm skanks. The way the bass bounces off the rhythm and leads, this track is sure to get your head bouncing and your mood enlightened. Next up comes “The Challenge,” which is one of my favorite tracks off the new record. Again starting us off with a rootsy drum fill and heavy bouncing bass line, it’s sure to get your head bobbing. The drums set this song off, with the hits on the 2’s and 4’s, emphasizing the rhythm that much more and setting off the bass, which dances around the rhythm just right. The change is a simple, yet noticeable one standing on one chord then gradually walking down to the original chords. A lot of the tracks on the new album are similar yet noticeably different in their own ways. Each having the defining attribute of a true roots reggae song with subtle experimentations and variations known only to those who will truly listen. I wouldn’t be surprised to see these songs used in a series of intense shootout/action movies. Overall, 10 Ft Ganja Plant achieved the goal in which they set out to achieve: to create and give the people of the world something that is not often heard today, roots reggae music. It’s amazing what a talented group of ever-changing musicians can achieve in as little as one weekend when the vibe is right. Visit http://www.10ftganjaplant.com to learn more.